Blogs are an excellent way to establish employees as thought leaders. And if a sales rep becomes a regular contributor to your organization's blog, it's more likely prospects will trust that rep as an industry expert—someone who knows what they're doing. And if the blogging is done correctly... as someone who is friendly and honest—someone they can trust. Sales reps are great at selling—of course—but that doesn't always translate into being a good writer. That's OK, though; not everyone is a great writer (though everybody writes). For all the good you're trying to accomplish with your blog, publishing mediocre content can have the exact opposite effect: It can make a sales rep (and your company or product) seem boring, pushy, or simply really bad at communicating. So, if you've identified a sales rep who wants to contribute but doesn't have the time to write consistent articles or isn't as powerful on the page as he or she is in person, a good solution is to have a marketer ghostwrite the blog posts. In fact, that can be a great way for the rep to develop a reputation and share his or her helpful experience and point of view while staying true to branding and messaging—all without being too salesy. The amount of effort you as a ghostwriter will need to contribute with each blog post or article ultimately depends on the availability of the sales rep and his or her writing abilities. 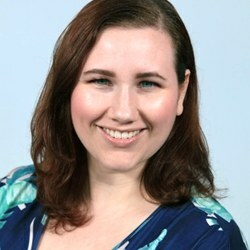 Laura Lentchitsky is the content marketing director at Ridge Marketing in New Jersey. She creates marketing strategies and content for B2B and B2C companies across verticals, including financial services, IT, healthcare, beauty, and retail.